A highlights tour exploring the iconic attractions of New Zealand. You begin in the ‘Adventure Capital’ of Queenstown and finish in Auckland the 'City of Sails’. 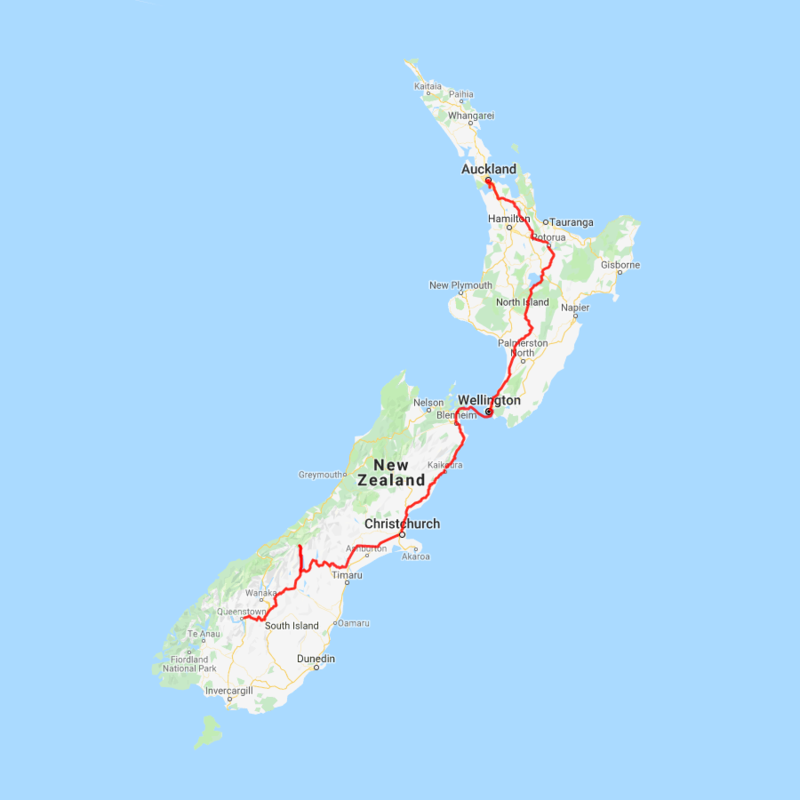 Along the way you’ll visit Mt Cook National Park, Kaikoura and the wine region of Marlborough before crossing the Cook Strait to the North Island. Highlights of the north include the Maori culture and thermal wonders in Rotorua and the harbour cities of Auckland and Wellington. On arrival into Queenstown international airport you will be met from your flight by one of our representatives. They will deliver your tour document pack containing everything you will need and assist you on your way. Today your drive from Queenstown to Mount Cook is a scenic one, so be sure to leave plenty of leeway for sightseeing. You'll go through the Kawarau Gorge and over the historic Kawarau Bridge - a popular bungy jumping location. Choose to participate in this daredevil sport or watch others instead. Continue on to the Gibbston Valley stopping at one of its many vineyards for tastings. Leaving the gorge you'll arrive in Cromwell, well known for its many fruit orchards. If you're a foodie at heart, we recommend taking a side trip to Bannockburn for a complete food and wine experience at one its many award-winning wineries and restaurants. Cromwell itself sits at the head of the Kawarau Gorge and the old historic town is well worth the visit. Completely submerged when the Clyde Dam was built and Lake Dunstan established in 1992, the remnants of the old Cromwell town provides a unique snapshot into this areas history. Head over through the Lindis Pass, one of New Zealand’s highest roads, with the summit reaching 971 metres. It's tussock covered hills are a barren but beautiful sight as you descend into the Mackenzie Basin. You'll go through the towns of Omarama and Twizel - the last stops before you arrive at Lake Pukaki and take the Mount. Cook Highway to arrive in the small village. The short drive from Blenheim to Picton takes you through more wine growing regions and the valley to the west of the Robertson Range. Picton is a port town and its here that the Interislander ferries arrive and depart. The town centre is quite small with plenty of shops and cafes and the waterfront area is a very pleasant place to spend a few hours watching the activity of the ships. The Edwin Fox Maritime Centre on the wharf is worth a visit with the star attraction being the vessel the Edwin Fox, reputably the 9th oldest ship in the world. The hills to the west of Picton are the start of Queen Charlotte Drive, a very picturesque road to Havelock and Nelson that winds its way along the shores of the sounds. Today you'll leave Rotorua for the bustling metropolis of Auckland. Head through the heart of Waikato king country and marvel at its lush dairy pastures. Follow the Waikato - New Zealand's longest river - through the small artsy settlement of Tirau and the township of Cambridge. Continue on a little further to arrive into Auckland, your destination for the night.